Journal : West Riding Lunatic Asylum Medical Reports ; vol. v.
London : Smith, Elder, & Co., 1875. Description : -292 p. [1 l. pl.] ; ill.: 2 phot. ; 21.5 cm. Photographs : one leaf with two autotypes of two clinical subjects. Photographer : Sir James Crichton-Browne. Subject : Brain — Mind ; affective disorders. Author caption: By J. Crichton Browne, M.D., F.R.S.E., Medical Director, West Riding Asylum. Son of William A. F. Browne (1805–1885), first lunacy commissioner of Scotland. Senior President, Royal Medical Society of Edinburgh, 1860-1861. Medical Director of West Riding Lunatic Asylum, 1866-1876. Appointed, Lord Chancellor's Visitor in Lunacy, 1876. President, Royal Medical Psychological society, 1878. President of the Neurological Society 1888. President, Dumfries Burns Club, 1892. First President of the Incorporated Society for the Destruction of Vermin, 1908. Founder and editor of the journal, West Riding Lunatic Asylum Medical Reports, 1871-1876. Cofounder and editor of the journal, Brain, 1879. Archive: Cambridge University Library, Darwin proofs for Expression of the emotions..etc. Photo caption: Autotype. S.S.B. & Co. (inscribed in negative). The two patients whose portraits accompany this paper have been in a state of chronic mania for five and six years respectively, and they are now in robust health, and show no signs of physical degeneracy. Their features do not betoken weakness and vacuity, but they wear that expression which is most common in chronic mania, and which is indeed typical of it—an expression of mingled mirth and mischief. — Page 289. Dr. James Crichton-Browne was only 26 years-old when he was appointed medical superintendent of the West Riding Lunatic Asylum, but his ten years of indefatigable stewardship turned the asylum into a leading research institute with a worldwide reputation for its brain dissections and somatic approach to the study of mental disorders. He ordered the construction of a physiological laboratory and endorsed the exceptional talents of David Ferrier (1843-1928) by installing him as director of the facility — it was at West Riding Asylum where Ferrier conducted his break-through research into the localisation of cerebral function. 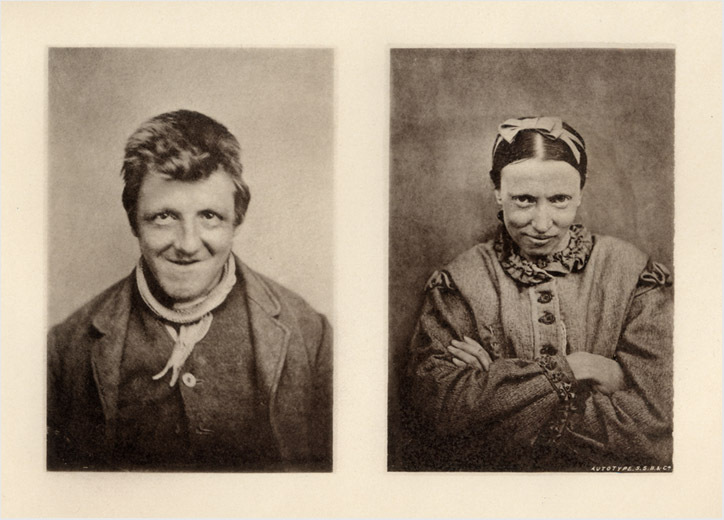 Crichton-Browne also ordered the construction of a photography laboratory and as an amateur photographer who was emulating the work of Dr. Hugh Welch Diamond, he created clinical portraits of disorders which were then disseminated to colleagues. He sent to Darwin a copy of Duchenne's, Mécanisme de la Physionomie Humaine, and provided so much additional resource material that Darwin offered to credit Crichton-Browne as a co-author of the book, The Expression of the Emotions in Man and Animals. This offer was declined and it has been suggested by some historians that the young asylum director was protecting his reputation by keeping some distance between himself and the controversial evolutionist. This could also explain why there is so little evidence of any acknowledgment of his debt to Dr. Diamond.